I consider it a good day when I remove an even number of socks from the dryer. I always put in an even number, that I know. With military-like precision, I unroll each and every sock from the hamper and verify its mate before throwing it in the wash. But somehow, by the end of the drying cycle, something’s gone awry. There’s usually one, lonely sock. I keep the single socks. What else can an optimist do? I once made a cardboard box to go above my wash machine and labeled it “Sock Orphanage.” Soon, it was overflowing with socks, yet when I dumped them all out to sort them, none of them seemed to match. One day, I realized that my husband, also an optimist, had been stashing lone socks on his side of the bed in a drawer. I gasped with such wonder and awe at this discovery, emotions not typically associated with socks. I ran to my own sock orphanage, and dumped the two collections of socks on the bed. I nearly cried with joy. So many happy reunions! Other than the isolated instance of the sock stash reunion, I mostly feel as though I lose just as many socks as I keep–it’s a little disheartening. Then came the game changer: crazy socks. My kids’ hampers have banana socks and goat socks; socks with unicorns and hamburgers, flags, avocados, and even bearded lumberjacks. We’ve lost fewer socks since this tiny tweak. Also, crazy socks are funny. And colorful. Also, there are entire stores devoted to crazy socks, and they are stores filled with whimsy and surprise and imagination. What an unexpected place to find happiness. I hope you find some unexpected happiness today. And may all your socks have mates. I love calendars, and crisp new calendars with empty squares gets me feeling all tingly with the thought of new possibilities and open-ended adventures. We are five days into a new year, and I’ve already pored over my calendars: all of them! I have iCal, Google Calendar, then the good ol’ paper calendar that hangs on my kitchen wall. We call that one “Command Central.” But all those open squares! I want to fill them with new experiences. 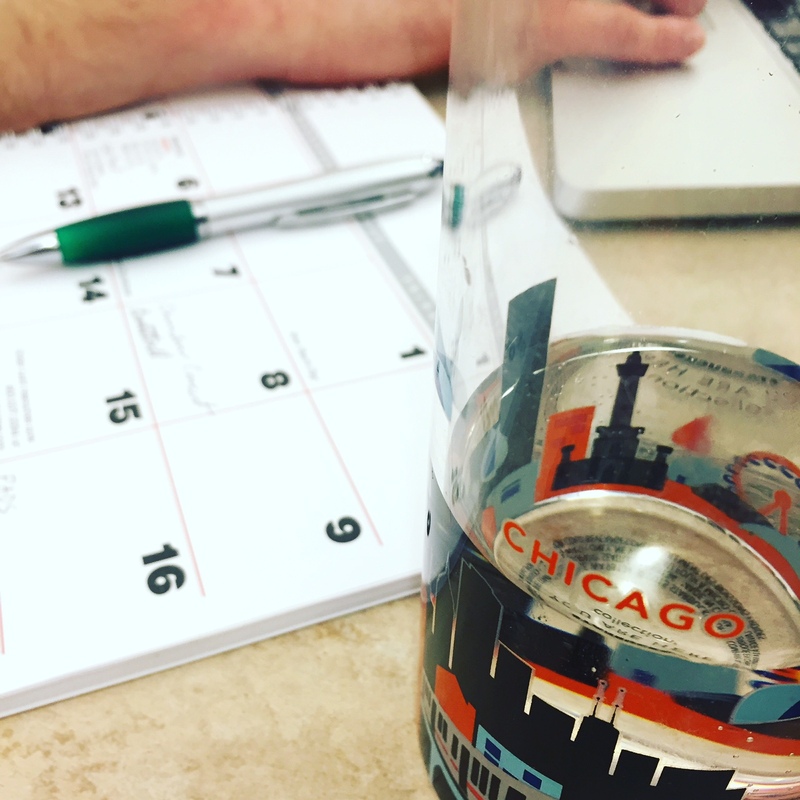 I’m taking a firm stance on New Year’s Resolutions—what are they, other than a checklist for my future failings? I won’t make any resolutions. Instead, I’m just taking my first step into 2016 feeling positive that something will happen. I just hope that whatever happens, I’m ready for it. All I know, is our family’s decision to move to a small house has been life-changing, which is what this blog is all about. The less space for living has allowed more space for living. It’s been eight months since we’ve moved to our little house of less than 1,000 square feet, and already, I can breathe easier. I feel better about the future, and find that my smaller house is opening doors for bigger adventure. As I write more about specific changes our family has undergone to declutter and pare down our belongings, I hope to connect with others on the same journey. Even more, I hope to give encouragement to someone who is feeling overwhelmed right now and are ready to make a change. You can do it! It’s never too late to start over. Living a smaller life in a smaller house is something I’ve idealized in my mind. We worked hard for months preparing our large house for sale, and we knew, once we moved to our current smaller house, it would be necessary to pare down our stuff. We cut our home’s square footage in half—from a little over 2,000 square feet to just under 1,000 square feet. So it would stand to reason that we had to get rid of half our stuff. It’s easy to say those words, isn’t it? “We’re going to get rid of half our stuff.” Doing it, however, is a dirty, ugly job. There is no easy way around it than to dig in and start pitching. We practically wore a groove in the road between our house and some of the Goodwill and other thrift shops in our area. Stores in our area received boxes of books, dishes, clothing and shoes from our family. Furniture was carefully loaded into the back of the car and dropped off for donation. My husband did the bulk of this job. He rolled up his sleeves and dug in. He had the sore muscles to prove it. 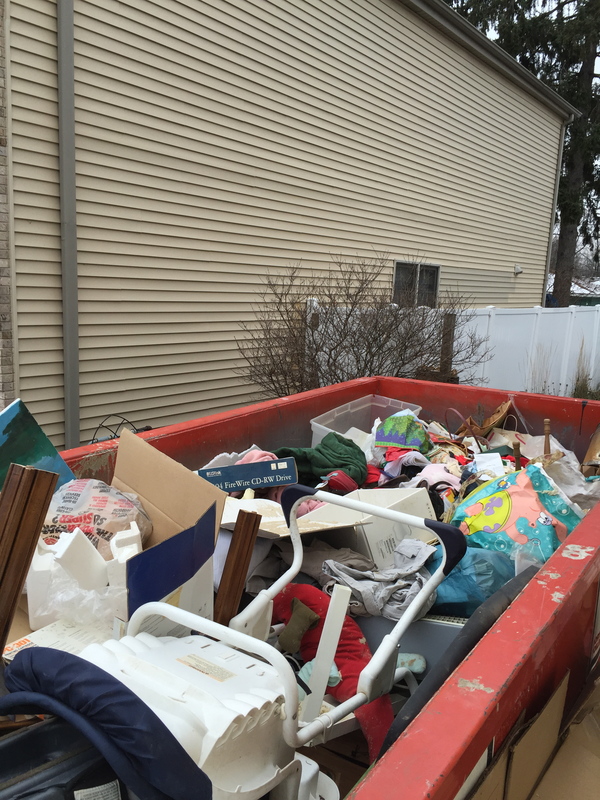 “I think I’m going to rent a dumpster,” my husband told me late last Fall. Our house was already on the market. By that time, we had decluttered our house significantly, and “staged” it to appeal to potential buyers. Although our house was the least cluttered it looked in years, sadly, most of the extras had landed in our garage. I was against a dumpster from the start. We didn’t have that much junk, did we? Um, yes. We did. 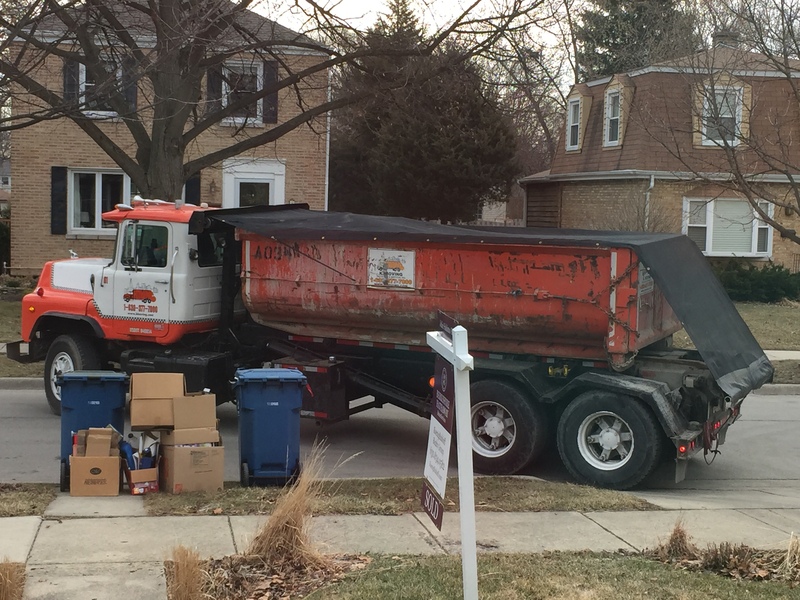 The dumpster was delivered to our driveway, a few feet from our garage. Within three hours, it was filled. A few months later, just a week before our move to our little cottage, we got a second dumpster. I am not proud of this fact one bit. I’m not proud that I was storing so many non-essential items in our home and garage. It was hard work, not only the physical lifting and dealing with every item, but also the emotional burden of opening boxes and finding old letters, painful memories, or items that held an emotional burden. The feeling of weight being lifted from my shoulders was indescribable! I hope this is the only time in my life I need a dumpster. I hope from now on, I will not keep things that are no longer bringing me joy. Better yet, I hope I don’t acquire them in the first place. From here on out, I will try my best to acquire things that don’t need to be dusted or stored: things like experiences, memories and friendships.